In a large bowl, combine flour, sugar, baking powder, cinnamon, nutmeg and salt, stirring to combine. In another bowl, combine egg, milk and vanilla extract, mixing together. Add melted butter to the dry ingredients, quickly stirring to disperse the butter and form small crumbs. Stir in milk and egg mixture, bring the dough together with a spoon. Before it comes completely together, add in blueberries, mashing some as you go along if desired and bring dough together with your hands. Form it into a large ball, then roll it out on a floured surface to about 1/2 inch thickness. Cut donuts using a donut cutter, a biscuit cutter, or even a knife, using a small lid to cut out the center. Repeat with dough scraps until all the dough is used. Heat oil in a large pot or deep fryer, bringing it to 375 degrees. Fry donuts 1-2 at a time, frying for about 1 1/2-2 minutes per side. After your first donut, check it by cutting into the center and making sure the dough is cooked through. 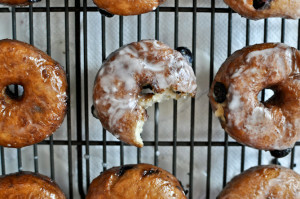 Finish remaining donuts, then dip the entire thing in glaze and let sit to cool before serving. 1 drop of vanilla extract. Whisk ingredients together until a smooth, runny glaze forms. If it seems too thin, add sugar a few tablespoons at a time, stirring. if it’s too thick, add more water by one very small drop at a time, whisking constantly. Dunk donuts in the glaze and let sit to set.